Knowledge on money saving tips is useless if you don't put them into practice. It is difficult to imbibe a savings mindset if you do not realize that spending in small change will amount to fortunes when they accumulate over time. Take time to analyze the table below. 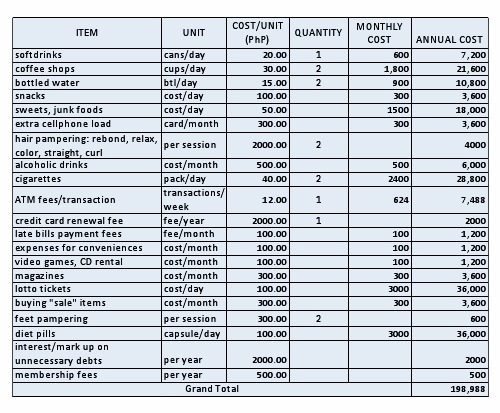 It estimates the cost of "small time" spending on things you can do without. Which items apply to you and make your own estimate. You will be shocked of how much small change add up to a substantial for big ticket projects you have been dreaming of. There are other unwise spending habits which many are guilty of but are not included in the above table such as eating out, partying, impulse buying. When you make your own table, you can add or subtract items which apply to you make your own estimates. Avoid softdrinks, junk foods and cigarettes altogether. They are unhealthy and will cost your health overtime. Bring your own water when you travel instead of buying bottled water all the time. The cost of two 355 ml bottled water is equivalent to a gallon of purified water. Consider healthier and cheaper alternative snack foods. It can even be healthier if you do away with the snacking habit. Transact only in the ATM of your banks. Charges are imposed on inter-bank transactions at most at P20 per transaction. Refrain from unnecessary debts or debts on items which can wait for a later date. Learn to delay gratification. Make this a part of your financial discipline. Pay your utility bills on time. A one time penalty fee of at least PhP50.00 is charged delayed bills payment. Look for banks which waive annual renewal fees of credit cards. Cancel magazine subscriptions. Optimize use of your Internet connections in search for ideas. Evaluate alternatives for expensive diet pills. Check your cellphone habits. Make your cellphone an asset rather than a liability. Cancel membership fees of affiliations which do not add value to your financial and personal goals. Lotto? Count the cost against the slim chance to win big time. P.S. In case, you are planning to build your own website, consider Solo Build It (SBI) tools. It is a cost effective alternative to website building and consistent with the money saving tips espoused in this article.